There's something really special about Ori and the Blind Forest. It's a touching story of friendship and kindness, told through a simplistic story and a beautiful art style. Yet something so simple, and so beautiful is also one of the best games available. While the original version of the game was released last year, the Definitive Version adds a few new areas and some welcome additions to the game. Two new areas have been added, and new skills are available to learn. The developers also added fast trace and a gallery mode, which includes behind the scenes developer interviews and development processes. At its core, you would have to describe this game as a platformer. Taking inspiration from side scrolling games like Metroid and Castlevania, Ori has you journeying through magical landscapes, trying to discover ways to restore the forest to its former glory. 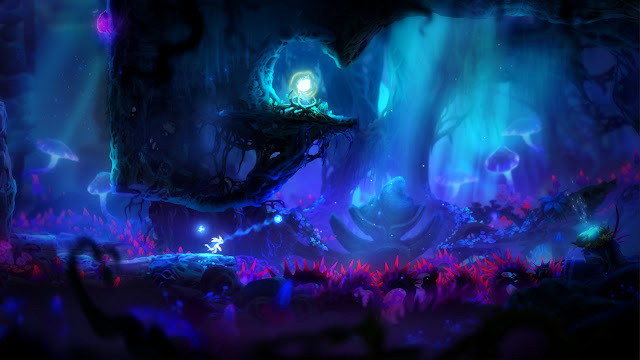 As you discover throughout the game, Ori, a child of the Spirit Tree, tries to gather the three elements that sustain the life of the forest. Through your adventure, you learn of the demise of the forest, torn apart by the spirits as they clashed with one another and this game becomes something more spiritual, and something much greater than just a platformer. The tranquility of the art style that fills the forest clashes heavily with those that live inside it. Ori acts as a vessel of light, and everything around him that tries to destroy him is the opposite. 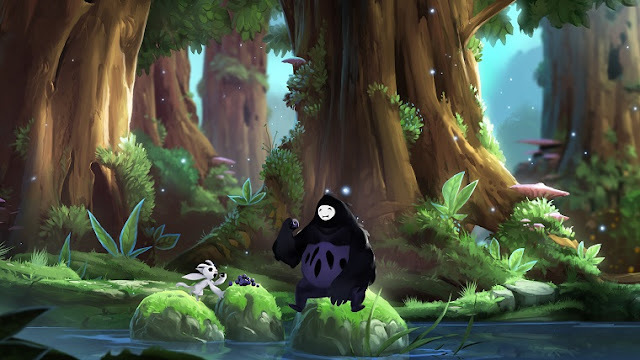 It’s fitting to be named the Blind Forest, as Ori is acting as the agent of change, bringing light and life back into the roots of this beautiful world. Areas where the elements have left, causing a destructive reign to plague that part of the land, features dark platforms in the foreground with bold colours defining the shapes in the background. These dark sections are distinctly different from the lighter areas, the two furthering the emotions that are being told in the overarching story. This darkness is combined with the difficulty, which came as a shock to me. There’s a lot of diversity in the enemy design, and you can easily be overwhelmed leading to your death. Similarly with the platforming sections, there are times where precision jumps are required, where only pressure or the threat of death, something very prevalent in these scenarios, cause you to fall to your demise. Luckily for Ori, and the player, save points can be created at any point in the game (assuming you have an energy orb to use). Energy orbs not only allow you to save your progress, they are used to open up doors or unleash powerful attacks. They can be replenished from pickups scattered over the woods and held by enemies, otherwise you have to be smart about when and where to save. The definitive version does include an easy mode, to cater to those that find the game too difficult, however I feel it can make the world not feel as hostile as it should be for the story that it is trying to tell. Prior to this new addition, there was no means of travelling to new locations quickly, forcing you to backtrack through past locations as you return with new powers, opening up new paths. The Definitive Version allows Ori to do so, yet with this faster and easier option available, I still walked everywhere. These locations are stunning and memorable, something that can’t be said for many other Metroidvania sidescrollers. 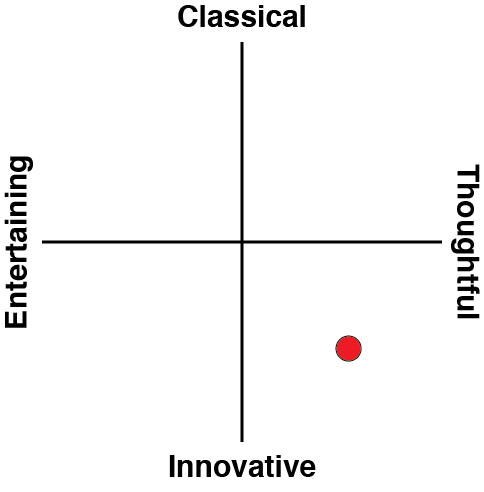 The game is accompanied by an equally and memorable orchestral soundtrack, which brings enough fantasy and emotion as the game design has. It’s a brilliant combination. It’s clear that Ori and the Blind Forest has had more than enough thought put into it. Thematically it shines as a prime example of show and not tell, the environment has so many stories burnt into it. Sadly other game elements don’t stand on the same level. 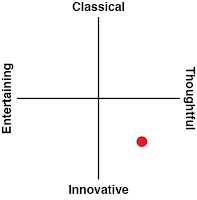 The combat is often a complete opposite offering compared to the preciseness the platforming requires. Nearly all enemies can be defeated by Ori’s guide, a floating ball of light that acts as a projectile shooter, however most enemies will be taken out through a furious mashing of the attack button. There’s no time for strategic attacks, as normally you are taking into account the hazardous spikes or closed spaces that encase Ori. And when you make a mistake, you will pay for it. Ori is a fragile being. It doesn’t take much to take him out and if you’re not careful, remembering to save, a brief moment can cause you many more minutes. 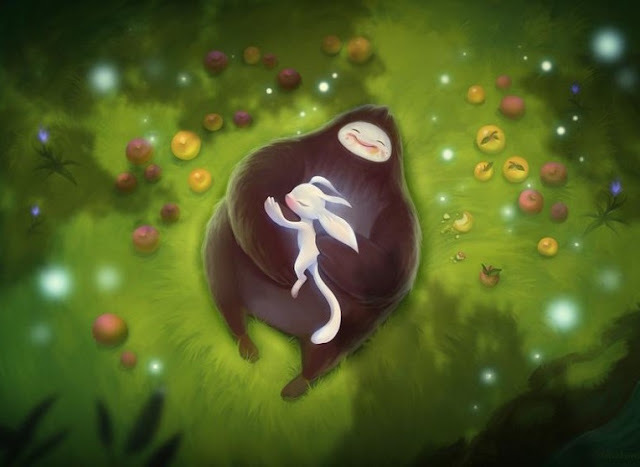 I cannot in recent memory think of a game that has moved me as much as Ori and the Blind Forest has. The art style, soundtrack and design of the game are all breathtakingly beautiful. On their own they stand strong, telling the story of the forest and its destruction in a way that is more powerful than a text prelude could ever be. Together, they combine into something that feeds off each other to create one incredible game experience. For players who have already played through Ori before, the definitive version’s new areas are a good enough reason to jump back into the forest, and for new players, there’s no reason to not experience what this game has to offer. It would have been nice to see the developers look at ways to improve the combat, but that would require a lot more work around, hence the introduction of the easy mode instead. I have experience a few issues on my high-end machine, so I would recommend the Xbox version to anyone that had the choice, yet with a bit of tweaking it will perform well on most systems.